The possibility of detecting oil slicks in photo-like satellite images depends on the slick being located in the sunglint region—the wide, washed-out strip where the mirror-like reflection of the Sun off the water is diffused by waves and currents. When the oil is located in that relatively narrow region of the scene, it can strongly influence how the water reflects light. Oil-covered water may look dramatically brighter or darker than adjacent, oil-free water. In this image from Sunday, June 27, 2010, eastern areas of the slick are more visible than western areas, even though analysis from the National Oceanic and Atmospheric Administration indicates heavy concentrations of oil in the vicinity of the leaking well, which is about 75 kilometers (47 miles) southeast of the Mississippi Delta (beyond the left edge of the image). 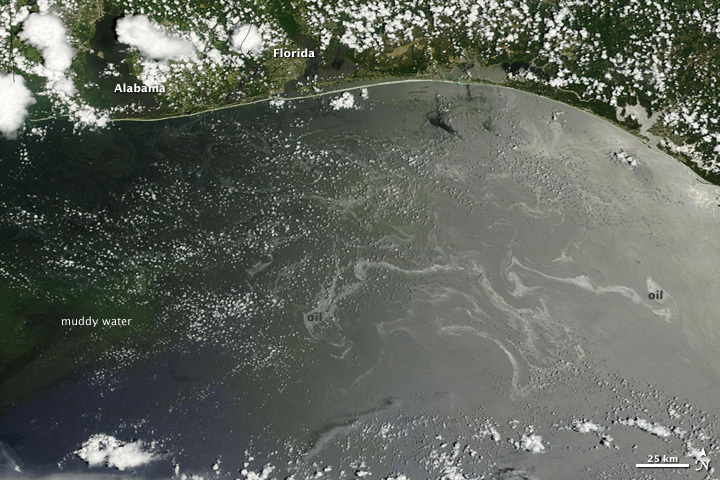 Ribbons of silvery-gray oil swirl in the waters off Alabama and Florida, while farther west—closer to the source of the leak—the reflection seems to be dominated by muddy water in the Mississippi River Delta. Although the oil extent does change from day to day, the big difference in the appearance of oil in this image versus the previous day’s image is the location of the oil in relation to the sunglint region. In this view from June 27, the sunglint fell across an area farther east than it did in the image from June 26, and so the oil is more visible there. 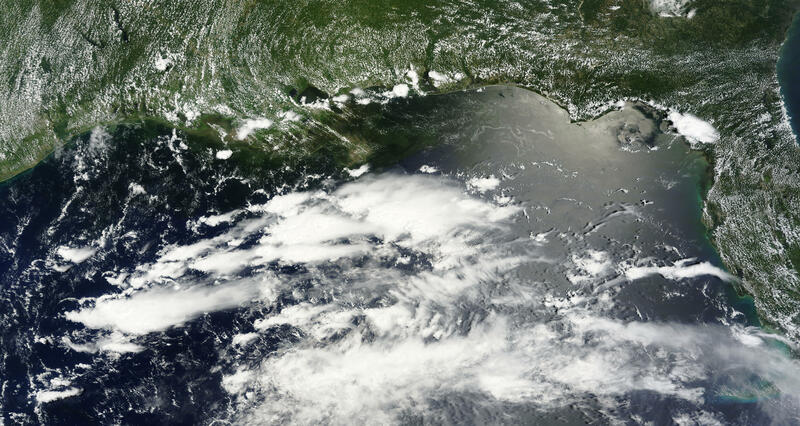 Oil is visible offshore of Alabama and Florida in this photo-like image from June 27, 2010.